Did you attend Toronto's first Nuit Blanche? Nuit Blanche is a concept that began in Paris and now takes place in Rome, Brussels, Madrid and Montreal. 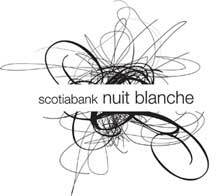 Nuit Blanche is a sleepless night of artistic expression meant to make contemporary art more accessible to one and all. From sunset on Saturday, September 30 to sunrise Sunday, October 1, 2006, an estimated 425,000 people were out on Toronto streets to encounter the city in a unique way and explore Toronto through publicly commissioned art installations, all-night exhibits, live performances, and creative programs featured throughout the city. Taking place in museums, galleries, institutions, and unusual spaces, or familiar spaces experienced in unusual ways, each featured free art programs all night long. For one sleepless night Toronto became the artistic playground for a series of exhilarating contemporary art experiences. Among the highlights of the night into day hours of Nuit Blanche, for this suburban art blogger, were partying in the ballroom with 10 year old dj's, wandering through the thick fog at philosopher's walk, entering Instant Coffee's Dark Disko yurt, going for a night swim at 3am and experiencing a strangely juxtaposed doom metal performance in front of the William Ashley store in Yorkville. The night presented a (mostly) democratic opportunity to access contemporary art. Children were out on the streets way past bedtime with their families. We all had wonder in our eyes. No doubt I was not the only suburban attendee at this event. Occasionally the Art Gallery of Mississauga does attract visitors from Toronto but, why not more? Does Nuit Blanche place Toronto as a "world class" city? Would the City of Mississauga and it's citizens ever support an event like this? How would you make art accessible to everyone in Mississauga? In reply, no this could not happen in Mississauga. Why? Because you and the other galleries here have not bred a culture among Mississauga citizens for these forms of artistic expression. The Art Gallery of Mississauga doesn't show performance, little installation and rarely work that I can think about for longer that it takes to view. I'm not getting a view of contemporary art from you. I found this blog site from your web site which in your mission states that you exhibit historical and contemporary. For a public institution neither of those catagories are well enough represented with significant artists. To your credit the exhibition now is a step in the right direction. It's a good looking exhibition but, not all that challenging. Which can be fine but need to be stunned and amazed and given something to really think about every couple of exhibitions. And also to your credit you are asking for feed back so here it has been given. I hope you are not sorry you asked and I also hope it has been heard. A blog is a good idea because it is a very current method of communication. You are not the only ones to blame. The Living "Arts" Centre is clueless. They can't possibly call what they do there "exhibitions". That space shows how much they care about exhibitions.For such a grand facility, they allotted a storage type space for the "gallery". Obviously an after thought. It's shameful when even the poorest artist run centres have better gallery facilities. Although the Blackwood has been exhibiting contemporary art in this suburb, they don't seem to care about the suburbans. People are bused in from downtown to openings. How about busing in Mississauga residents so we don't have to pay for parking and just to encourage us to come? There is obviously the attitude that those who create, appreciate and support culture are not from Mississauga. No nuit blanche type event can happen unless you believe in the city you are in Blackwood! Have any of you given thought to Mississauga besides that you go there to work? I can safely assume none of the Blackwood staff live here. You do not speak to Mississauga residents, you speak past them and you look past them. This blog's header describes the "culture drain" to Toronto. That's because those of us seeking substance here are patronized. AGM,I hope you keep up the great blogging and get more comments so we can dialogue. I studied art at UTM. I'm embarassed to say that we didn't know much about the Mississauga Art Gallery. We were encouraged to get involved with Oakville. I think my friend tried to volunteer once but she was never called to help with anything and never met anyone.